Buying rural property and escaping the city smog is a dream many Australians have. The rolling hills, fresh air and warm sunshine make the perfect setting for a holiday home. But there’s one hurdle – building a home on rural properties isn’t easy, and can take months on end. One Aussie builder overcame this problem by using a prefabricated kit from Cedarspan. 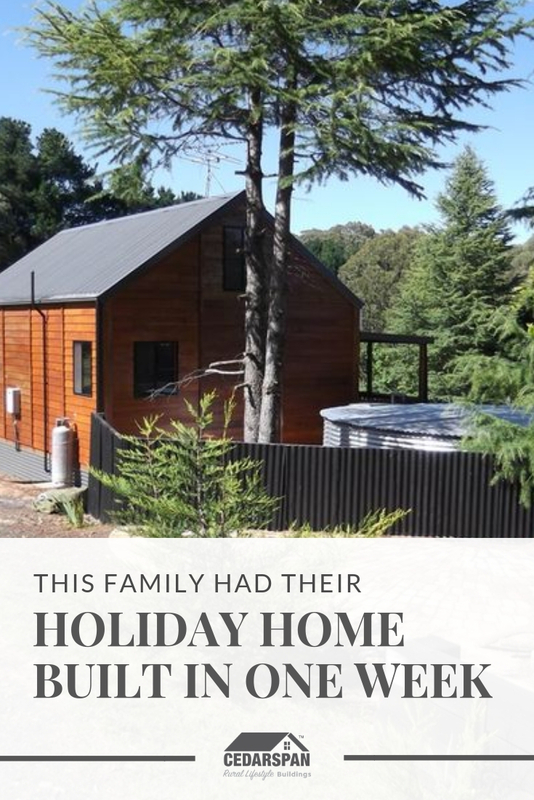 He assembled this classic holiday home in just 5 days on a property in Kalamunda, Western Australia. The perfect setting for a rural weekend escape, airbnb or holiday home. The large verandah creates the perfect spot to sit and watch the sun rise (or set) with a warm cuppa in hand. Prefabricated in a few weeks, assembled in 5 days. 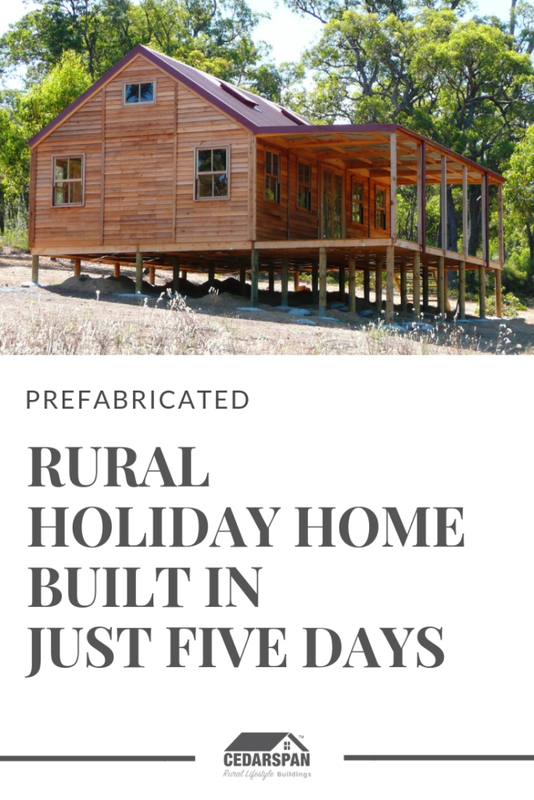 The cabin was prefabricated in-factory into sections, so once it was delivered to the property, the builder just had to follow the included instructions to put the pre-made pieces together. This took just 5 days, and he’d never done a project like this bef0re. Cedarspan Cabins are made-to-order, so you can select the size, finishes, options and layout, and really make it your own! The cabin is the Cedarspan 30H50 Loft Cabin. It measures 5.6 x 9m, providing enough space for 1-2 bedrooms, a kitchenette, bathroom and living area inside. Also shown are the extended verandah, premium Western Red Cedar cladding and handcrafted cedar windows. Click here to download pricelist with all options & dimensions. Another time-saving factor is the raised timber floor system. This means that a concrete slab is not required, saving time and money onsite. 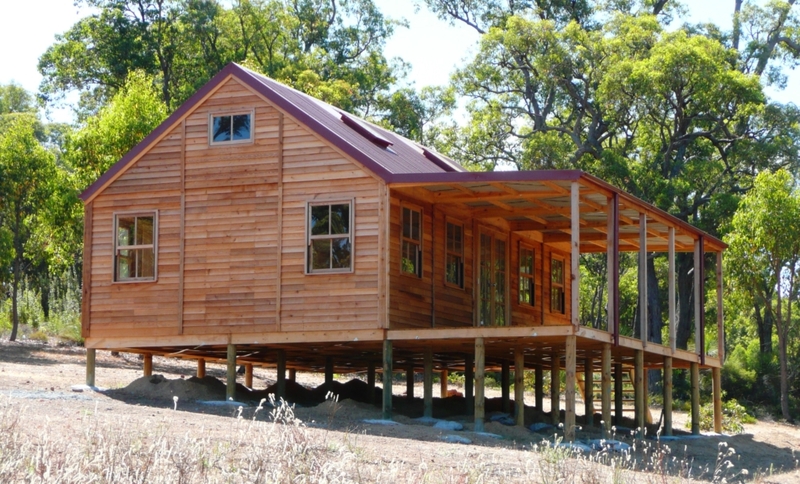 It also means no site levelling was required, so the cabin could be installed directly on the sloped property. Want to see inside a Cabin? We’ve got a few buildings on display at our factory in Girraween, NSW (about a 40 minute drive from the Sydney CBD). It’s amazing to be able to experience them in person. To feel the wood grain, try out the windows and swing open the doors. To step inside and be able to picture what you will create in your airbnb or holiday home cabin. Appointments essential. Call 1300635966 to book your appointment now. If you can’t come and visit the displays in person, next best option is to stalk our Instagram (go for it, you’re welcome! ), where we share photos, tips and the occasional walkthrough video.